As the only MotoGP stop in North America, the Red Bull Grand Prix of the Americas has become an important event in the U.S. motorcycle industry, beyond the racing world. But it has not been known for throwing surprises at us. Just the opposite. That changed this year. Here are 10 surprises you didn't expect to see at the Circuit of the Americas in Austin, Texas, this weekend, starting with the most obvious. 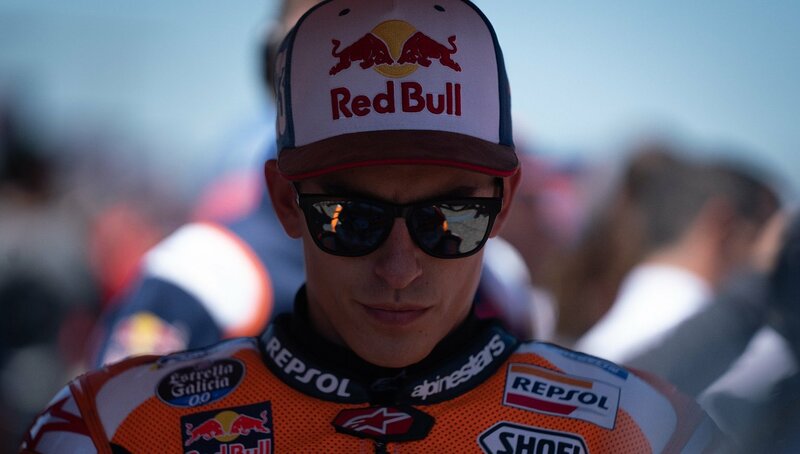 Márquez was a career 10 for 10 in MotoGP races on U.S. soil before this weekend, including six for six at COTA. He easily qualified on pole Saturday. The only debate to be had Saturday night was what his margin of victory would be on Sunday. Then he crashed out of the lead on lap nine while he had nearly a four-second lead. The whole thing was a like a slapstick comedy where a coronation of dominance was supposed to be taking place. Márquez low-sided, tried to get back on the bike and fell over again, tried unsuccessfully several times to start it, fell over again, and gave up in humiliation. 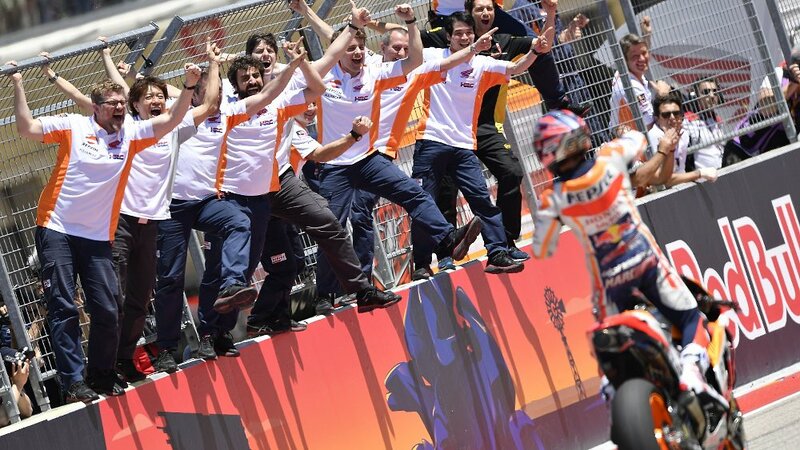 One hell of a streak came to an end, Márquez dropped from first to fourth in the championship standings, and absolutely nobody expected that. It's not that big a surprise that Álex Rins finally broke through and won a MotoGP race on the factory Suzuki. We all expected it to happen sooner or later. But I defy anyone to show me a pre-race prediction of Rins as a favorite this weekend. The way he gracefully carved up Valentino Rossi in the final laps of the MotoGP race, and the way he stayed focused and calm under the pressure from Rossi after he did take the lead, were things of beauty. Things the MotoGP riders agree on when they come to COTA: They like coming to the United States, they like Austin, COTA is a beautiful circuit with a layout they enjoy and quality facilities, but the track surface itself is getting so bad some riders say they shouldn't even have to race on it. The problem is the shifting subsurface the track is built on. It causes bumps and ripples that the riders say are getting worse each year. There's no question some of the crashes we saw this year were a result of those bumps. From its technical layout to its spectacular tower to Austin's cool vibe, COTA is a great place. But in the end, a race track really consists of the asphalt between the curbs, and in that sense, Austin, we have a problem. Yoshimura Suzuki teammates Josh Herrin (2) and Toni Elias (24) split the MotoAmerica EBC Brakes Superbike wins at COTA to go along with Alex Rins' win for Suzuki in MotoGP. Photo by Brian J. Nelson. By winning the MotoGP race and both MotoAmerica EBC Brakes Superbike races, with Toni Elias on Saturday and Josh Herrin on Sunday, Suzuki won everything it could win in Texas. Apparently the Yamaha rider got confused. He was given a ride-through penalty (ride through the pits, that is) for jumping the start, but he seemed to think he was supposed to take the on-track penalty lane that's new for this year. So he did. Twice. On laps five and six. That cost him about four seconds a lap, but then he still had to do the ride through the pits, which cost him about 16 seconds. Andrea Dovizioso had to start the Grand Prix of the Americas deep in the field, in 13th spot. But when all was done, it turned out to be a good weekend for the new championship leader. Ducati photo. It was the Ducati factory rider's worst qualifying effort in years. Surely, he would lose a ton of points to Márquez and put himself in a hole in the championship run, right? Well, not so much. And even after Márquez crashed, it looked for a while like Rossi might leave Texas with the points lead. In the end, it was a great salvage operation for Dovi. He picked up half a dozen positions on the first lap and held steady through all the attrition to take a very valuable fourth place. They say championships are won not on your greatest weekends, but on the bad ones. Dovi arguably did more to improve his odds of winning the championship this year with his fourth-place finish at COTA than he did with his dramatic win at the opener in Qatar. We're near the low point in U.S. participation in MotoGP racing. Joe Roberts in Moto2 is the only U.S. rider in the series. He was involved in a three-rider crash in the first corner of the Moto2 race on Sunday in the kind of racing incident that is really nobody's fault and all too common back in the pack. His race was over before his first braking marker. OK, I'm cheating a little on this one, because he was just a passenger on his good friend Josh Herrin's bike on the victory lap, but still, you have to admit you didn't predict that, either. Álvaro Bautista had to don some different, cool-weather gear at Assen, but the end results were the same. Ducati photo. It didn't happen in Texas, but the other surprise this racing weekend was the postponement of Saturday's Motul Dutch Round of the Superbike World Championship at the TT Circuit Assen in the Netherlands due to: snow. Really. What wasn't a surprise was that the two full races run Sunday (with the shorter Superpole race cancelled) were both won by Álvaro Bautista. Some things are still predictable.